Raize Zune Video Converter is a powerful video to zune converter software, and can be use to convert popular video to Zune or MPEG-4 format that can be played on Microsoft Zune Player. It is capable of converting DivX, XviD, MPEG, MOV, MPG, MOD, QuickTime, MP4, 3GP, 3G2, SWF, GIF, DV, MJPEG, VOB, WMV, ASF, AVI to Zune or MPEG-4 video format. The Raize Zune Video Converter's built-in encode/decode engine can offer you the fastest conversion speed, and allow you to handle all popular video formats. On the plus side, Raize Zune Video Converter provides the ideal way for you to convert video to DivX, XviD, MPEG or MP4 video formats, or convert your various videos to MP3 audio format to be played your Zune Player. Support Microsoft's new operation system Windows Vista. Convert most popular video/movie files like MP4, DivX, XviD, MPEG, MPG, MOD, ASF, MOV, QT, 3GP, 3G2, WMV, VOB, and AVI to zune format supported by Microsoft Zune Player. 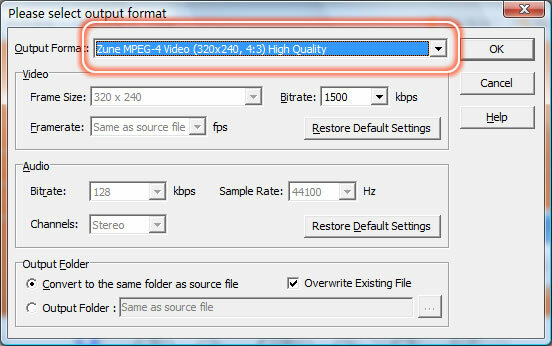 This program is also a MPEG-4 converter, and allows you to convert your digital video/movie to MPEG-4 or MP4. It allows you to extract audio track from video, and convert your video to MP3 which can be played on zune player.